Oct. 17, 2017 5:30 p.m.
On a cloudy Monday afternoon, students from Dunsmuir Middle School gathered at Allandale Pit to see something many had never witnessed before — the launch of a rocket. 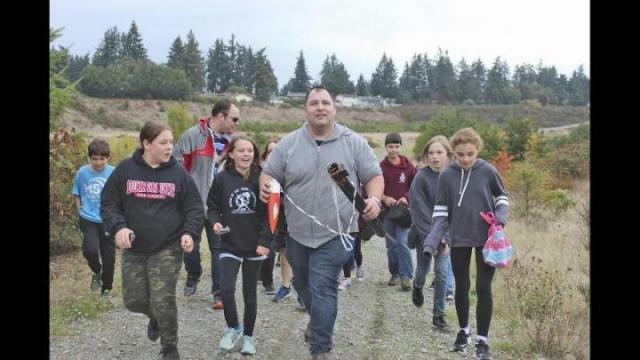 The Grade 7 students were not disappointed after the two G-motor rockets launched 2,500 and 3,000 feet into the air, reaching peak speeds of roughly 1,200 kilometres an hour, before eventually crashing down to the ground. The launch was part of the middle school’s hands-on Science Technology Engineering and Mathematics (STEM) Tech ed unit on the aerodynamics of flight. For the last several weeks, 14 students started with the basics, learning about the theory of what goes on inside a rocket, and how propulsion, drag and lift works, among other things. Next, students made individual rockets out of reinforced cardboard with a poxy coat, and learned how to sand and cut rocket fins to help it stay together during the launch. According to teacher Jordan Whyte, who has been running the rocket launch part of the program for the past two years, the class is a great learning experience and teaches students the application of theory to design. “They applied their theory to an actual working model and then lit it off and saw their creations come to life, and I think making that jump between the theory and the hands-on application … is absolutely critical,” said Whyte, noting launching a rocket is not an activity many schools in the province offer.